In a pursuit that has spanned continents, Iolanthe, Titus, and their friends have always managed to remain one step ahead of the forces of Atlantis. But now the Bane, the monstrous tyrant who bestrides the entire mage world, has issued his ultimatum: Titus must hand over Iolanthe, or watch as his entire realm is destroyed in a deadly rampage. Running out of time and options, Iolanthe and Titus must act decisively to deliver a final blow to the Bane, ending his reign of terror for good. In this epic conclusion to the Elemental Trilogy, Iolanthe and Titus must continue to avoid the forces of the mage realm of Atlantis, while continuing on their ultimate quest to bring down the evil Bane, who has been using sacrificial magic to prolong his own life for hundreds of years. 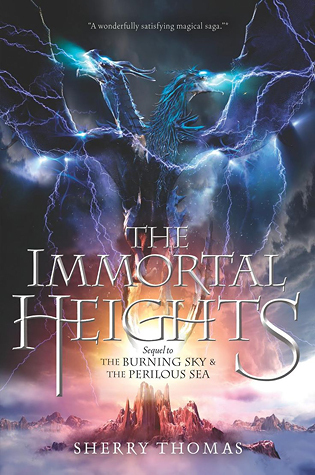 The Immortal Heights was a satisfying ending to the trilogy, although it wasn’t quite as epic as I’d hoped, based on how much I enjoyed the previous books. It did have some of the beautiful moments and recognizable places that I loved from the first two books, but there was an overwhelming melancholy about it, given the nature of the final quest, that got kind of old as the story went on. There was a lot of setting up in the first half of the book that slowed things down a lot, and that wasn’t helped by the fact that I didn’t get a lot of time to read this past week so it took me a while to get through the slow parts. Once the action started though, it was very hard to put down. The romance in this series is simple but so sweet (and rather swoony at times!). There are no love triangles, just a slow burn early in the series and then just cuteness for the rest of the time. Iolanthe is a bit of a no-nonsense sort of girl anyway, and I get the feeling she’d slap down any sappy romance if Titus tried it on, unless she asked for it beforehand! As I said in my reviews of the previous books, the magic system is quite fanciful and simple. Spells can do just about anything, and the spellbook/training-ground/swiss-army-knife of the Crucible just seemed to hold a few too many answers for my liking. There were plenty of epic and flashy battles in the lead-up to the ending, but there wasn’t actually much to the final battle. Still, there was tragedy and destruction enough to go around. I’d recommend re-reading or binge-reading the series if you can. It’s been a full year since I read The Perilous Sea and a lot of the details had really escaped me. It took me a good while to remember what had happened, and I wish I’d re-read or at least skimmed the end of book two before getting into this one. 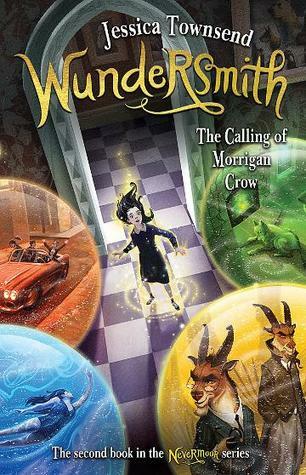 – If you like the idea of a fierce girl hiding out at a Victorian-era Eton College, where the prince of the secret mage realm studies, then get a hold of this beautifully written series. Overall, I loved it and it will be going on my re-read list.